Cover Commander creates professional, custom-designed three-dimensional virtual boxes for your software, 3D mockups (Laptop, iMac, iPhone, Tablet), e-books, Blu-ray discs, manuals, and even screenshots. 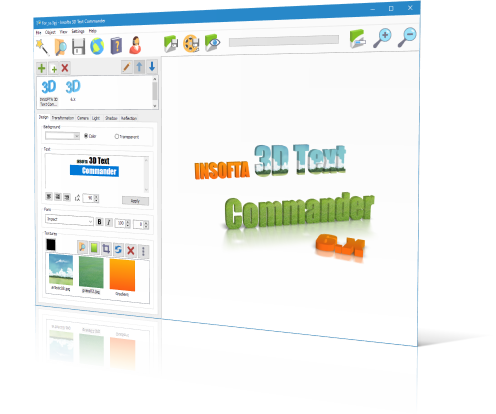 3D Text Commander turns any plain-text message into a captivating 3D text, letting you create your own 3D text logos, banners, messages and save it to your computer for use on your web pages, in presentations. Are you not satisfied how your website or application looks like? Do you use customary free icons that thousands of other webmasters and programmers already utilize in their projects? Want your product to stand out and look better then your competitors to generate more sales?